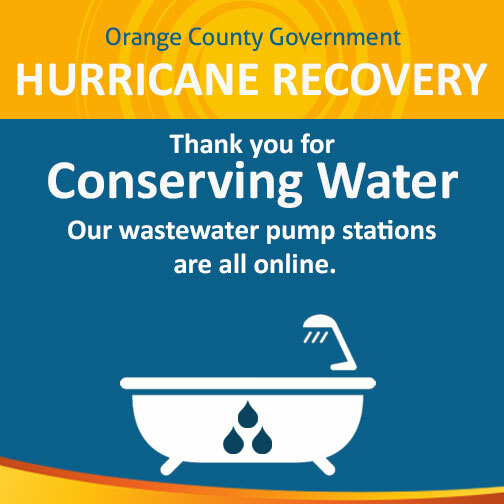 All of Orange County’s nearly 800 wastewater pump stations have been restored, after more than 50 percent had been impacted by Hurricane Irma. Residents were asked to limit their water usage to reduce the impact on the wastewater system. However, However now that all pump stations have been restored, water consumption, including use of dishwashers and washing machines, may resume to normal levels. Just after the storm, more than half of the county pump stations (446) were offline due to power disruptions in the wake of the storm. Crews and generators were in the field by 3:30 a.m. Monday, September 11, to begin restoration. The public’s assistance reducing the amount of wastewater produced was asked to aid crews with these efforts. UPDATE: Sept. 20, 2017, Lake advisory due to bacterial contamination from Hurricane Irma have been lifted for Lake Jessamine.